What does the mind always want? Success or Failure? Success! Right? Running after success, do we ever stop running? Have you ever come across someone who says that I am finally successful now? Do you understand the meaning of the word,’finally’? Nothing after this, final, full stop! ‘I fully well and finally know that I am successful and my chase stops here. After this no more thoughts of getting this, or obtaining this.’ Have you ever come across a person who says this? So, you are continuously running after success, without ever getting any final success. Right? Intermittently you get the illusion of success, that is alright. You did something and you felt successful in that, but it is never final. Is it ever final? Sooner than later you discover, ‘Oh my god! Not sufficient. I want more, I want more!’ And that ‘more’ never suffices. Right? Are we then ever successful? We are running after success, that is alright. But are we ever successful? Remember if we are actually successful, then we will stop running after success. Not getting it? Are we ever successful? We are never successful. I know that it is hard to admit. But go and find a man who is really successful. You will have a hard time. You won’t find such a man who is really successful, who says, ‘Success is mine now, I am not running after it anymore.’ You won’t find such a man. Failures we already are, but we don’t realise it, because realising this would hurt us very badly. No? Try doing that. Try telling somebody that you are a failure. Try telling the man in the mirror that you are a failure. Go, look at the mirror, and try telling that man or woman in the mirror that you are a failure, and see how it feels. How does it feel? Bad! Our self-esteem takes a beating. Right? We start feeling low. ‘Oh! Am I so unworthy? I am a failure? The ‘F’ word, the bad ‘F’ word, Failure.’ Failures we are, but we don’t admit it. Who admits that? Nobody admits that. What does it mean to say that ‘real success lies in failure’? It means that the one who comes to realize that he is a failure, stops running after success. And once he stops running after the success, that means that now he is successful. Realization of failure is success, running after success is failure. If someone tells you to chase success, ask him, ‘When will the chase end? Because if I am actually successful, then the chase should end.’ Ask him that when will the chase end. ‘Alright I will chase success. As per your advice I will chase success but also tell me when will it end. And how will I know that it has ended? And can you show me somebody for whom the chase has ended?’ Just ask this much. Just ask this much and you will realize, what is really happening. Admit that human effort cannot get it, cannot get the real thing, admit that. Surrender to that fact. Surrender to the fact that the real juice of living lies in peace, and you will not get peace by chasing success. Admit that love makes life worthy, and you do not get love by chasing success. Admit that unless you are seated in the Truth, you will keep suffering. And you do not sit in the Truth by chasing something else. Admit that whenever you will chase, you will only go away from your essence, from your real home. And the moment you admit, you surrender, you give up your ego, you give up the restless tendency. You are successful, already successful. When you admit you discover that you should not have gone after it, it was already yours. There was no need to run. You are already home. Do you know how we trade them away? By setting up wrong priorities. What is a priority? A priority is a trade-off. A priority is a deal. When you say, “This is my priority,” what you say is, “I will do this at the expense of something else,” because the list of priorities is always there. When you say that something is number one in your priority, what you are saying is, “I will get this thing. And I am prepared to leave number two, three, four and five.” That is what ‘priority’ means -a trade, a deal. Now for the mind the list always comprises of things that will give it a false sense of security, pleasure, acceptance and all that. The Essential is way down in the priority list. If you speak to the so-called common man, and ask him to list the priorities in his life - just circulate a form and ask people to list their priorities in life - you will probably not find words like ‘freedom’, ‘truth’ etc. at all. People will write: money, car, status, job, career, this and that. You will not find words like ‘Truth’ at all. "Let me be called respectable, acceptable. " "Let me give up friendship, and gain a network." You will be beaten at both ends. Truth – you won’t be able to give up. So it will keep calling you and disturbing you. It is very obstinate. It’s like a pestering wound – Truth. It doesn’t let you sleep. You think you have given it away: “I have traded it away.” It’s like trading away your soul - you trade it away, yet it doesn’t go. It calls you in your dreams. You can’t sleep. You think you have given it away, but it won’t let you sleep. My mind is always wavering. How can I get concentration? Mind doesn't waiver. It goes to the direction it is programmed to go to. Before we proceed to find out about concentration, I would, to help, introduce a term Attention. Attention is a quality of the mind. Attention is the deep desire of the mind to understand. Understanding means settling down, becoming quiet. However, remember that there is a difference between attention and concentration. In attention, there is no specific object. Attention is the quality of the mind in which it is alert to everything, including itself. Hence, whatever is in its purview its its object. Alternately, there is no (specific) object. Alternately, the mind itself is its own object. In concentration, there is a process of ego-based choice involved. Concentration is fragmentary. Concentration is upon a specific object that the ego has chosen for its benefit. Concentration does not give understanding, it only gives pleasure and satisfaction. I would advise you to further read from the blog on focus, concentration, attention and understanding. I am sure it would be of help. Running after success, do we ever stop running? Have you ever come across someone who says that I am finally successful now? Do you understand the meaning of the word ’finally’? Nothing after this, final, full stop! ‘I fully well and finally know that I am successful and my chase stops here - after this no more thoughts of getting this, or obtaining this.’ Have you ever come across a person who says this? So, you are continuously running after success, without ever getting any final success. Intermittently you get the illusion of success that is alright. You did something and you felt successful in that, but it is never final. Is it ever final? Sooner than later you discover, ‘Oh my god! Not sufficient. I want more, I want more!’ And that ‘more’ never suffices. Are we then ever successful? We are running after success, that is alright. But are we ever successful? Remember if we are actually successful, then we will stop running after success. We are never successful. I know that it is hard to admit. Failures we already are, but we don’t realize it, because realizing this would hurt us very badly. Try this. Go, look at the mirror, and try telling that man or woman in the mirror that you are a failure, and see how it feels. How does it feel? Dream: The thought of success born out of a feeling of current failure. Real: No thought; just a realization of current fulfillment. Dream: An aspiration of the future. Real :A contentment in the present. The objects change the chase never ends. Real : No chase is to be taken seriously. Dream: Validation required from others. Real : Innate, no validation required. Dream: Continuous struggle and tension. Dream: Work and effort with tiredness. Real : Work with playful energy. These are some excerpts from clarity session held at the office, Surely they will help you. Speaker: If you are peaceful, if you are joyful, if you are centered, if you do not always feel like running after achievement, then no change is needed. Everything is alright. Look at this. When you are running after achievement, what is this that you are saying? ‘I want success.’ When you say that I want change, when you say that I want success, what is that you are saying? ‘I do not accept things as they are. I want something new which I can call as success.’ That is proof enough that there is something unsettled in the mind, that the mind is wandering. Speaker: We all want change. We feel bored, we feel restless, and we want change. But we are looking for the change at the wrong places. We think that the change lies in the future. We think that accomplishments can give us that change. We think that by becoming something in the future, the change will come. Or we think that change lies in a person or in an object, that by getting something, by getting money, by getting a house, by getting marks, by getting a job, by getting a girlfriend, that change can come. We are desperately in need of change, but we are mistaken in our diagnosis of what the disease is. Yes, there is a great urge in the mind to change but we do not understand that urge. We want satisfaction but we do not really know where that satisfaction comes from. So we are looking for satisfaction at all the wrong places. We are looking for that satisfaction in the entertainment, in pleasure, in company, in success, in relations. But you will not get it there. Speaker: Restlessness is right now. But what do you say? ‘Satisfaction will be when I get a job two years later.’ If restlessness is right now, should you search for the cure two years later? If a patient is suffering right now, will you give him the medicine two years later? When should be the treatment be, if the disease is right now? The disease is today, because you are feeling the restlessness today. So, when should the disease be cured? Speaker: But you do not want to cure it today, you want to postpone the treatment to the future. You say, ‘I will be happy when I get respectability, when everybody will honor me.’ You say, ‘I will be satisfied when I have this and that in the future.’ This is self-deception. 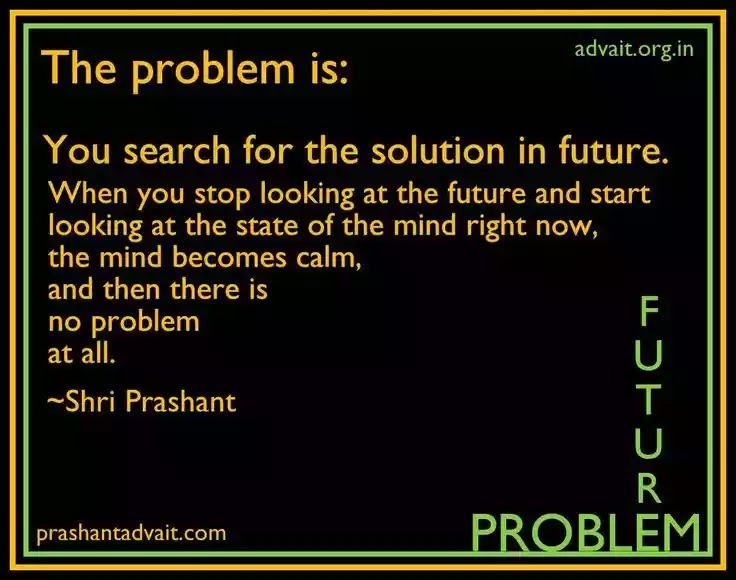 The problem is right now, solve it right now. Look at the problem right now. In that looking itself the problem evaporates. In that attention itself, it is found that there is actually no problem. 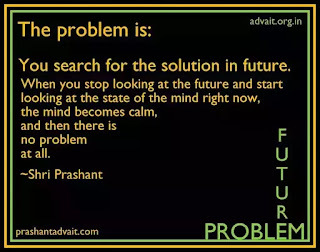 The problem is that I search for the solution in the future. When I stop looking at the future and look at the state of the mind right now, the mind becomes calm and then there is no problem at all. So, we have said two things. One, it is certain that we are dissatisfied, there is restlessness, this restlessness is evident in every action. It is evident in the way we walk, we eat, and we talk to others. It is evident in the way we use the mobile phone, it is evident in the way we approach our career. It is evident that we are restless. This is the first thing. The second thing is that we have found false solutions, false treatments for our restlessness. Those false treatments will not work. Find out the real treatment. And when you try to find the real treatment you will incidentally discover that there is no real disease. The real disease is that you want treatment in the future. You look at the mind, and it becomes silent. Right now, as you are listening to me, there is no problem. You are alright. You are fine. But the moment the mind starts wandering, again there will be lots of problems. This lack of attention is the problem. Nothing else is the problem. It is said that Relationships are give and take, how? Why does humanity finds only few people to care about it? Dear, let me tell you an incident that took place when the British attacked Lucknow. The city of Lucknow, the ruler there, Wajid Ali Shah, was busy playing chess. His generals stood in front of him and said, ‘Give us the orders to march. Give us the orders to face the British.’ The fellow said, ‘Wait. I cannot afford to lose this game.’ How can you fight the bigger battles of life when you are engrossed in the imaginary battles? How can you fight the bigger battles? The real problem, how can you look at it when imaginary ones are so heavy upon you? So what did the British do? When they captured the Nawab, they carried a procession of him through the streets of Lucknow, like a caged animal. So there was a vehicle on which his cage was kept, and that cage was provided with all the amenities, a very nice and soft mattress, pillows of the best kind and a huge chess square was kept for the Nawab. That’s our situation. We are captured, we are in a jail but our chess piece is entertaining us. That’s the purpose of entertainment in life. So that we do not look at the jail we are in. For most of the people, the greatest issue is, ‘Mr. Verma’s son got two marks more than my son.’ If this is the situation, then how can we be bothered that the glaciers are melting? How can we be bothered that the humanity is probably going to be eliminated in next few decades? How can you be bothered? ‘How are my hair looking?’ That’s the biggest issue for you. ‘What comment did he post on my Facebook status?’ That’s the greatest issue in your life. How does it matter to you that there is so much nuclear pile with man today that he can destroy the earth a thousand times? For you the greatest issue is, ‘Is this shade nice?’. You know you visit one of these popular news sites. ‘What are the greatest issues that they are telling you? Ten wardrobe malfunctions that you did not see.’ Then you go and click there. That’s the heading; that’s the link. Ten wardrobe malfunctions that you did not see. Ten actresses without makeup. These are the biggest issues you must know. About what? Something.Not only these news sites, see what is happening on this very site? As you open it, there will be an advertisement asking you to get girlfriends, will ask you to browse some photos of some models. So what all this is about? They are telling you ten things that you must know. Who are they to educate you? But you allow yourselves to be educated by them. And then they become the real issues in your life. ‘Oh! Ten things that I must know, Oh! here too as well I can find girlfriend.’ Ten new fashion trends this summer. And girls quickly click. ‘So what is happening? Last time the in color was purple green, this time it is jasmine green. If you are wearing purple green, then you are so outdated, old. Go and buy jasmine green.’ Now she is comparing purple green and jasmine green. I don’t know how their eyes differentiate between these wavelengths. And there is the teacher who is trying to educate you about what are the real issues in life. ‘Ten fancy bikes worth having. So M.S. Dhoni is riding one, John Abraham is riding another, Robert Vadra is riding the third one, and you are looking at them. Your eyes are now glued to the screen. Tell me. Does it matter to you that the ground water has been so damn polluted specially in states like Punjab that there is one train which goes to that state which is called ‘Cancer Express’. Does it matter to you? Do you ever talk about that? And that is not too far from here. What do you talk about? That’s what your mind is full of. The hills are being denuded. Does that matter to you? But you will pay all your attention to all the rubbish that is there on the T.V.. You will know everything about new movie releases. You will know every bit of damn gossip that is going around. Do you know what is going on in the Middle East? Do you know that Africa is burning? ‘Have you got your hair straightened? How much did you pay?’ Real issues. ‘Are are you going around with Varun these days?’ Such an important issue. So, It is a good idea. But that’s what, just an idea. One cannot look at this and that when there is so much happening in my own house. There is a civil war going on right where I am standing. How can I be bothered about this and that? How can I be bothered about how many animals are dying in the forests, how many species are being eliminated every day, how the global temperatures are rising due to climate change, how can I be concerned about them when I am locked in my petty issues? Firstly, what does security mean in context of being a woman? What is danger? Because you talk about security when you are in danger. What is danger? Let us say, you face a snake and then the snake goes away. There are two kinds of happenings possible in this incident. One; the snake goes away but never really goes away. Second; the snake actually goes away. It sounds like a riddle, right? I will make it simpler for you. Let’s say there is a photographic plate in front of you and a mirror and a snake passes in front of both of them. Off-course, the snake is fearful, it is a poisonous snake, it can cause death. So, there is danger, real danger. When the snake is in front of the mirror and the photographic plate, it will show up in the mirror and in the photographic plate as well. Correct? You look into the mirror and what will you find? A snake. Correct? And you look into the photographic plate and there also what will you find? The snake because the snake is there, right now at that instant. But then the snake goes away, in a while the snake goes away. Will the mirror still show the snake? What about the photographic plate? It will still show the snake. Now the snake has caused a permanent imprint on the plate. The plate can never forget now that a snake passed in front of me. The snake is long gone, one year, two year and the snake is not returning. But the plate remembers permanently the snake has caused a permanent impression on the plate. The plate is living in perpetual fear, constant fear. What are our minds like? The mirror or the photographic plate? Mostly like a photographic plate. It is alright to respond to danger when danger is in front of us. When snake is there, alright, let the mind show the snake, let the mind occupy the snake when the danger is there. But even when there is no danger, a mind full of fear remains afraid and that is hell. There is nothing, there is actually nothing but the mind is imagining so many fears. That can happen, this can happen. When you imagine so many fears then what do you want? Security. How many of these dangers that we are talking of are actually real? Because the question of security arises only when the danger is real. To the extent danger is real, its alright.It’s alright to talk of security but why talk of security when danger is imaginary. Why act like a photographic plate? Mind has become permanently filled with fear who can’t forget what happened long time back, still living in the past. Are you getting it? Now how do our minds act? You read of one particular instance in the newspaper and it creates a permanent imprint on our mind. Right? The mind gets full of fear and now because the mind has become fearful, it cannot be attentive, it cannot understand the reality. Once a mind has been captured by fear, it becomes impossible for us to know the reality because an afraid mind cannot look directly. You cannot understand anything when you are afraid. You read one instance in the newspaper and you forget that there are lakhs and lakhs of working women in a metro town, metro city. One count of twenty lakhs, what percentage does it make? A miniscule. But how do we take it? As if this is happening with everybody. As if there is a real danger in front of me. Because you are not attentive, you are not looking at it carefully. And because there is a powerful constituency, powerful forces who gain by terrifying you. If you are not afraid why will you watch these channels that spread nothing but fear? Have you ever observed this? If you are afraid you watch further that makes you further afraid because there is powerful constituency, powerful forces who gain by terrifying you. Have you ever watched this if you are afraid? You watch more of the news that makes you further afraid. If you are afraid you watch more of the news that makes you further affected. Fearful. When you are afraid you watch more of the news, you in fact select that news to watch that terrify you all the more and you know this. They also know this. The newspapers and the TV channels, they know all this. They know that peace does not sell. They know that calmness does not sell. They know that agitation sells. They never publish that tonight one crore people in metro slept peacefully, they will rather publish that there was some murder somewhere. Now one crore people are sleeping peacefully and that is not news. They know that this is peace and peace does not sell. But one murder sells and that will be flashed again and again. Have you ever wondered why these newspapers are always full of only greed and murder and rapes? Only that sells because we are afraid and we want to read that. There is titillation in that. There is some kind of pleasure they derive in reading that. Is that real? Fear is justified to the extent when danger is there, beyond that fear is just madness. There was this Buddhist called Nagarjuna. He talked about a painter who filled his entire room with terrifying paintings painted by him. So, on one wall he painted a demon, on another he painted another horrible scene. Something here and something there and he painted that himself. And then he becomes totally afraid of what he has painted. Such is our foolishness. First of all we create those imaginary fears and then we are afraid of what we ourselves are imagining. Are you getting it? First of all you paint something, that imaginary thing and then you become afraid- ‘oh god how horrible!’ and you forget it is not there, you yourself has painted this, it does not exist. First you create it and then you faint. Paint and faint. That’s your life. You believe in your own lies. First of all you lie to yourself that this is the world, such is the state of the world and then you start believing in your lies and then you cause damage to yourself and those near to you. That is one part about security. Alright. The second part is about being a woman. Security in context of being a woman. Security has a price tag attached to it. It comes at great cost. The price of security is freedom. The more secure you want to be, the more you have to give away your freedom. And that has been done to women since centuries. Behind the pretext of making them safer, more secure, their freedom has been taken away. There is a great security in a cage. A bird in a cage is very safe and secure. No cat and no dog can hurt it. And the master feeds it daily, regularly, once in the morning and once in the evening. There is a great security in a cage but do you want to be in the cage or would you rather want to fly in the vast sky even if that means running a little bit of risk. Yes, what do you want? A little bit of risk but flight or great security in the cage? Speaker: But if you want to fly there is a little bit of risk involved. An eagle can snoop down upon you, you may die and you will have to look for your food at your own. No master will feed you regularly. Women have been made or attempted to be made very secure. And what they have been given? They have been given the confinement of a house that they stay in these four walls so that they remain secure and that has killed them. Women in order to be made secure have been given all kinds of wheels that if you wear this then you are more secure. You want to be like that or rather run some risk but live at least. Right? You are intelligent, excercise that intelligence. Alright. 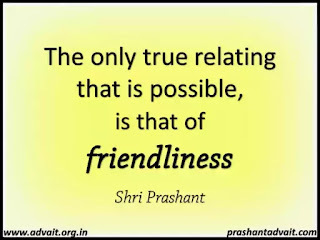 I would like to invite you at www.prashantadvait.com for more clarity. 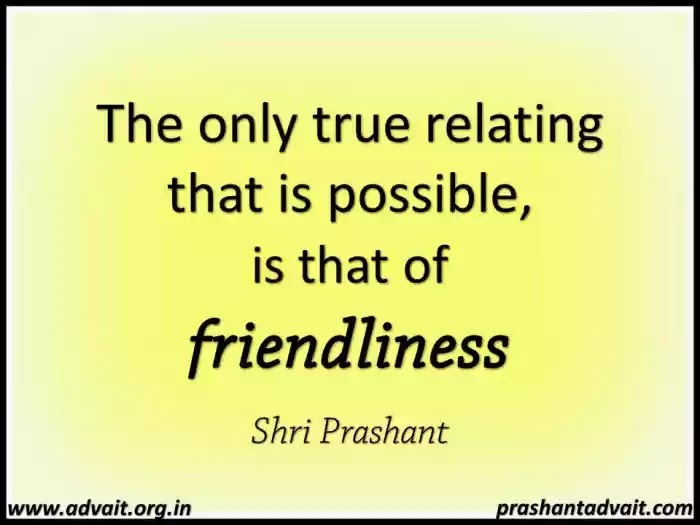 Dear, I am posting some few excerpts from my samvaad session on the same topic. It will surely help you. Speaker-Work is of two kinds. One is the work that you have read of in your Physics book which is the expenditure of energy, the kind of work that you can measure in calories, joules and electron volts. It is the physical work. We are not to bothered about it because it is anyway happening all the time in nature. The other kind of work which is more significant is mental effort, is mental churning, is mental happening. Getting it? These are two kinds of work. One is the activity that takes place physically. The activity that takes place physically is not really work even though your physics text-book would have made you believe so. You know there is something called as ‘basal metabolic rate’? You know even when you are sitting here, you are ‘working’? You are working physically without any mental work happening. Even as your body is burning energy, metabolism is happening, but you are not thinking about it. It is just happening on its own. You may be very peaceful, very silent, yet work is happening. Let us take a day-to-day example. Let us say that there was a particular day in the college when you did not like attending your sessions and from eight in the morning to four or five in the evening all you did was to attend the sessions. All you did was just sit and walk, but no great physical activity. At 5 p.m., you felt tired mentally even though you had expended just two hundred kilo-calories. After 5 p.m. you go to play soccer. In playing soccer you spend a thousand kilo-calories, five times the amount you spent in the entire day. In playing soccer, a lot of physical work had happened but it did not tire you down. Because the real hard work ‘just’ happened. You were not thinking every moment that I have to chase the ball, I have to pass it, I have to do this way. The crux of the matter is: live in understanding. When you understand something, hard work happens on its own. So, yes hard work is the key to success but not mental hard work. Thought will not lead to success. The settlement of thought, the understanding, that is success. Thought always says, ‘I will lead to success.’ In thought success is always in the future, ‘I will lead to success.’ In understanding success is right now, in that very moment, instantaneous, immediate. ‘I have understood and I have started acting’, and that is success. ‘I have understood and because I have understood, action is simply happening. Action does not wait for my permission. It even does not ask for my intervention. I have attained such clarity that I have to act.’ Action will happen. This is success irrespective of the result. It does not wait for the result in future that in future result will come and then we will decide whether it is a success or a failure. ‘I have understood and from that understanding the action is happening and that action itself is success, right now.’ The notion that you talked of that I will work hard and in that working hard a particular result will come and that particular result will be called as ‘success’, this notion is obviously not valid. Are you getting it? Listener 2: Why do we distinguish between success and failure? Speaker: We distinguish between successful and failure because all our activity, all our work is only for something in the future, the attainment of which we call as ‘success’ and non-attainment of which we call as ‘failure’. See, we never do anything for its own sake. Whenever we are acting, we are acting to attain something ahead of us. So what is important, the action or the attainment? Action is right now, attainment is in the future. Whenever we act, whenever a common man acts, it is for the sake of the attainment in the future. The action has very little value. In our mind, in the conditioned mind, the value is given to that result, that attainment in the future. So, it is obvious that when ‘that’ result is important, the attainment of it will be called as ‘success’ and the non-attainment of it will be called as ‘failure’. But if there could be a mind, there could be man who finds joy in the action itself, then ‘success’ and ‘failure’ will have no value. If you give importance to the result, if the result is what you are chasing, then success and failure will be of great value and all that is happening right now will only bore you down. You will never be present into it fully, because your mind will be there, ahead, something is to be attained. So, that is one kind of success, to be obtained in the future. you can visit my blog-http://prashantadvait.com/ for more clarity. 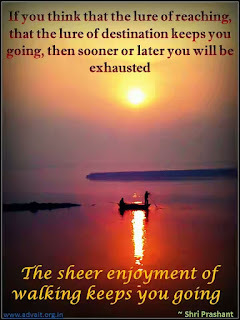 ‘Exhausted’ means that all the pent-up, suppressed energy, comes into motion, takes a release. But this is the most painful, mechanical and time-consuming way of getting rid of your burden, the Prarbdha Karma. It is like your palm is kept over a burning piece of coal, and you can get relief only when all the latent energy of the coal is exhausted. Most painful, unintelligent and time-consuming way of coming to the end of suffering. And in this process, coming to the end of suffering, coming to exhaustion, is possible only if no fresh fuel is added to the fire. It is possible only if one has the patience and faith to bear all the results of his previous karma, without creating new cause-effect cycle, without adding to his inventory of more unspent fuel. If the fellow has so much intelligence, patience and discretion that he can sit through the ordeal of the coal consuming his hand, without creating more ripples and fresh karmfal, if the fellow actually has so much intelligence and patience, then why would he sit through the torture? He would rather get up and walk away. What does it mean to get up and walk away from the unexhausted fuel, from the unspent residue of your previous karma? What does it mean to do that? 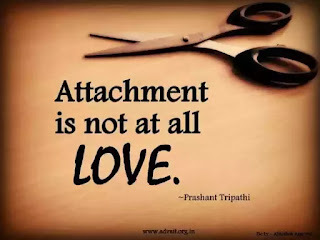 It means that you are no longer attached to the coal. Remember, the coal does not come to burn your palm. You are the one who goes to the coal, keep your hand over it, grab it, and allow it to burn you, pierce you, torment you. Walk away from the coal, that is an easier way. Why wait for the coal to get exhausted? Remember that pieces of coal come from ‘mines’. No mine, no coal. What all is ‘mine’? Whatever is ‘mine’, is the unexhausted piece piercing yourself. To walk away from that burning mass, is to walk away from your very being, your very identity. So it is upon you. 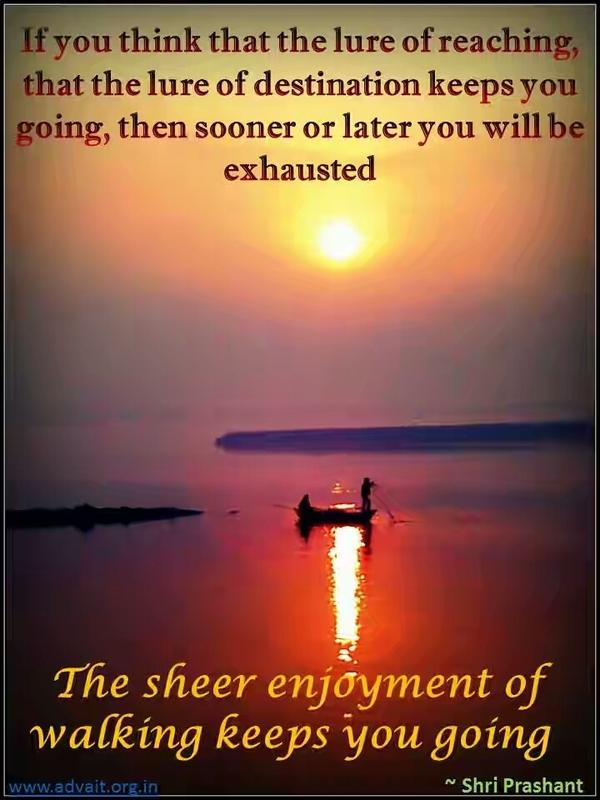 You can either wait with all your patience and all your intelligence for the coal to get exhausted. Or you can simply discard the coal, reject the falseness of its association with you, and walk away. And no method is better than the other. It totally depends on your mood. If you are in a mood to suffer – welcome, exhaust the karma. If you are in a mood to not to take suffering anymore – walk away, let go, drop it, renunciate.